Subarus seem to grow on you. At least, that's been my experience when reviewing some of their models. While I liked the Forester immediately (and still do), when I drove the new Legacy last year it took a while for me to warm up to it. Over the course of my review I started appreciating it more and more until, by the time I turned it back to Subaru, I had gained a grudging admiration for the car. That's better than falling in lust with a vehicle right out of the box and then noticing that the glow fades over time. Anyway, this grudging respect was also the case during my time with the 2009 Impreza WRX, a decidedly sporty car that's renowned for its on and off road prowess. 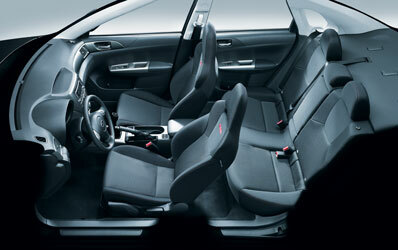 For 2009, the Impreza has been given a new body (sedan or 5 door hatch) that I happen to like quite a bit. The old Impreza looked okay, but the new one is more modern in appearance, with a bold new front grille and aerodynamically-sculpted profile. The WRX version comes with a ground-effects body kit, a functional hood scoop, and a rear spoiler sSubaru says was derived straight from rally competition. Impreza's multi-reflector halogen fog lamps are placed low in the front fascia and new for 2009 is a tilt/slide moonroof I couldn't open due to the intense cold we had during my test, lest the interior and its occupants turn immediately into one big popsicle. That weather contributed to some of my initial angst about the WRX because, besides the colde, it was also very snowy and the road conditions during my week were positively horrendous. This meant I had to shelve any thoughts about winding this little rocket out and concentrate on just keeping it on the road. On the other hand, it also gave me a chance to get a good feel for the car's symmetrical all wheel drive system, which proved to be excellent when the roads resemble hockey rinks. The AWD – and the typical electronic nannies cars have today – kept me safe and secure, yet the nannies (stuff like vehicle dynamics and traction control) still allowed a bit of fun to be had before reining things in. The heart of the WRX is Subaru's 2.5 liter "Boxer" engine, in this case a turbocharged version that burns premium fuel. The "Boxer" name comes from the way the cyliners fire toward each other, like boxers punching each other out, instead of being lined up in one (an "inline" engine) or two banks (a "V" engine) of cylinders. According to Subaru, the Boxer is mounted longitudinally in the chassis, resulting in a lower center of gravity for better balance and reduced friction. The WRX' turbocharged pugilist cranks out a healthy 265 horses @ 6,000 rpm and 244 lb-ft of torque at 4,000 rpm, both of which are plenty to motivate this relatively light car. The power comes on quickly, with little turbo lag – something that was quite pleasing after the WRX I drove several years ago, which was saddled with an automatic transmission and had enough turbo lag to make me want to get out and push. Not so this time. While it would've been nice to have some dry twisty bits, I managed to get a bit of a feel for how the car would be in good conditions and I believe it would be a blast to drive. Perhaps Subaru will send another one this summer…. 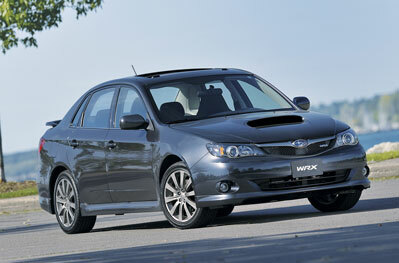 A sport-tuned four wheel independent suspension contributes to the nimbleness of the WRX. Up front, you get a strut-type suspension with lower L-arm and a double wishbone rear. Stabilizer bars are mounted front and rear. Brakes are discs with ABS all around, with good pedal feel. Steering is variable-assist rack and pinion and it's also very good. Add all this handling stuff together and you have a very nimble car. Indeed, you can't argue with the performance stuff – but you can argue about the living conditions. Get inside the WRX and it's like you're in a time warp, or a car from the 1990's. The interior materials aren't particularly rich-looking or feeling (but remember that this is primarily a sports car), and you only get a five speed manual transmission (and a rubbery one at that) in an age of six speeds. There's no auto headlight position and no single sweep setting for the windshield wipers which so many cars have these days. Power abounds, including the outside mirrors and all four windows, but only the driver's features auto-down and it doesn't feature auto-up. The driving position is great, though (helped by a tilt/telescope, leather-wrapped three spoke steering wheel) and as further proof of the sportiness of the WRX the instrument panel features a big tachometer in the middle, with a smaller speedometer off to the right. The instruments are easy to read and the controls are laid out logically. Unfortunately, the fabric on the seats is an absolute hair magnet. Cat and dog hair would enter the car via our clothes, like what it saw there, and decide to take up residence – and getting it out again was a major operation. At least it cut down on the amount of vacuuming we had to do inside our house. That said, the performance-design front seats (with embroidered WRX logos and red stitching) are quite cool, very comfortable and hold you in nicely for spirited driving. And I liked the fact that the integrated head rests don't stick out too far and make you tilt your head forward as happens in far too many cars. The automatic HVAC system is awful. Maybe it was the extreme cold, but it was either too hot inside or you froze your buns off. And if I took the system off the defrost setting the windows would start fogging up immediately, even with only the driver in the car. So the driver had to fog up instead. On the upside, the HVAC controls are well designed and easy to use. The audio system is decent, though very bassy. It doesn't have a lot of steam, either, but the sound quality is good. My test unit also had SIRIUS satellite radio built in, which is always a nice bonus. The car has an excellent greenhouse, with terrific visibility all around. And headroom! I felt as if I could stand up in the WRX. Exterior mirror are well sized and placed to minimize blind spots. The sunroof is small, but adequate. Subaru also includes plenty of little storage spaces, and the rear seat splits/folds 60/40 to give access to the generous trunk. 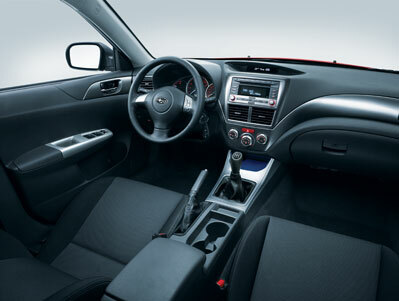 Safety equipment includes dual driver and front passenger front airbags, an advanced frontal airbag system, side curtain airbags (for front and rear outboard occupants) and seat-mounted front side-impact airbags. And of course there are belts for all positions. I probably wouldn't buy the Subaru WRX, but not because of its mechanical stuff – I really enjoyed driving it. It's lots of fun, has lots of power, and seems designed to play. But, since my family has three cats and a dog, I couldn't live with those hairy seats! 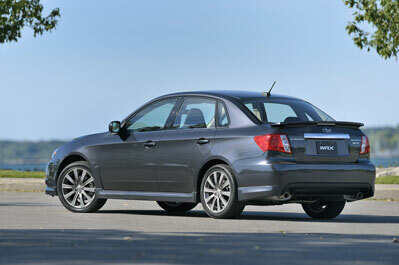 The Subaru Impreza WRX four door sedan starts at $24,995 U.S./$30,995 Canadian.